If I were to not mention panfish such as the bluegill in the fish series I’ve been writing, I would probably upset a few anglers, as bluegill are another of those fish that has quite a following. When I gave community college classes, I had several options, generally it was walleye, but I let the class tell me what species they were interested in, with panfishing/bluegill one of my more popular classes. Bluegills, a member of the sunfish family and in some area referred to a as bream, brim, sunny and other regional names. It’s a North American native fish found in streams, rivers, lakes, and ponds throughout much of the United States. They come in many color variation from a dark green, olive-green, greenish brown with yellow or off-white along their lower belly. Depending on what type of body of water you take them from, their color may vary. Many of the state and national record fish have come from small lakes, farm pond, gravel pits and stock dams as bluegills do well in most bodies of water and water conditions. The Nebraska state record fish, 2 pounds 13 ounces, came from Grove Lake, for a fish to qualify for the states Nebraska Master Angler citation, it needs to weigh 1 pound or be at least 12 inches long if released. The Nebraska daily limit of panfish is 15 in a combination of bluegill, orangespotted sunfish, pumpkinseed, redear sunfish, green sunfish, and all sunfish hybrid with 30 the possession limit. In South Dakota, their state record bluegill came from a Stanley County stock dam and was a 3 pounds 4 ounces fish, and to qualify for South Dakota’s Proud Angler award your bluegill must be 1 pound or 10 inches long if released. South Dakota’s daily limit for panfish, which includes a combination of bluegill, green, pumpkinseed, redear and orange spotted panfish is 15 with a possession limit of 30. Bluegills are active throughout the year, especially during the warm weather, but are one of the main species Ice anglers go after during the colder months. 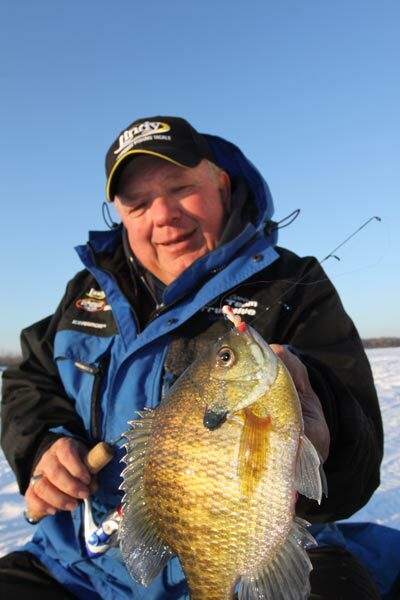 If you’re into Ice fishing for panfish, bluegill it can be a great way to spend the day, if you’re on the ice early when bluegills are feeding, both livebait and artificial lures work well. Because the fish’s metabolism has slowed, you’ll want to downsize your baits and fish more methodically, not getting into a big hurry. Bluegill and other panfish caught out of cold water are some excellent eating and are worth spending a day on the ice fishing for them. Once the ice is gone with water temperatures rising, all species of fish will be preparing for the spawn. Bluegills like the bass are nest/bed builders, with the males building the nests and guarding the fry. Their spawning ritual is much like that of the bass with the bluegills spawning beginning in the later part of May on through August, with the largest amount of the spawning happening when water temperatures reach the high 60’s to 80 degrees. The females of this species are quite choosy, going to the nest with the larger males, with the smaller males always trying to sneak into these larger nests to try to fertilize the eggs. Bluegills grow up to 12 inches, with some even larger, the world record bluegill taken in Alabama tipped the scales at 4 ½ pounds. Young bluegills feed on very small aquatic creatures and microorganisms, while the adults feed on small aquatic insects, larvae, crayfish, leeches snails, crickets, water bugs and small fish and when times are tough, feed on aquatic vegetation and even their own eggs and fry. They are also one of the prey species for the larger aquatic predators including muskie, bass, walleyes, blue catfish, flathead catfish as well as snapping turtles and herons. Bluegills like to relate to shallow water structure, tree stump, brush and weeds, and can live either in deep or in shallow water. They like other species of panfish feed the heaviest during low light periods, dawn and dusk, but you will find some feeding throughout the day. Bluegills are one of the best fish to start youngsters and beginning anglers on, as bluegills can be aggressive feeders. To help me locate the bluegill and other fish, I wear a pair of Flying Fisherman polarized sunglasses as they cut the glare allowing me to see below the surface. They also protect my eyes from the harmful rays of the sun, as without them, the sun would dry my eyes out, where I would have less time on the water, shortening up my fishing hours. I’ve caught plenty of bluegills using livebait such as worms, crickets, maggots, grubs and grasshoppers, suspended below a bobber and depending on the concentration and the aggressiveness of the bluegills; even caught them on a bare hook. Artificial baits that I use for bluegills includes tiny spinners, such as the Mepps, small crankbaits resembling a grasshopper or small crayfish, small jigs tipped with a grub, worm, insect or Berkley Gulp, small safety pin type spinnerbaits and small red surface poppers. When using artificial baits for bluegills, I’ve had my best luck fishing with baits with some red, orange or yellow coloration. If I’m bobber fishing, I like to use some sort of a slip bobber rig, where I can easily adjust the depth of my bait by simply sliding the slipknot up or down. Pursuing bluegills on the bed, you’ll need to figure the approximate depth of the fish beds, set your bobber at that depth, cast into the deeper water as to not spook the fish when the bait splashes down. Then slowly bring your bobber rig into the depth the fish are bedded. Once your reach the beds, don’t get over anxious, twitch your bait from time to time near one of the beds and if that fish does not want to play, move onto the next one. When going after fish on the beds, work from the farthest outside bed, this way, you won’t spook those fish on the beds closer to shore. Once you have hooked a bluegill, it heads for deeper water and generally landed without messing up your fishing on the shallow beds. Remember, when fishing any species of fish on the bed that every fish you take out of the equation, means there are less fish, down the road. With panfish, there are generally plenty of smaller fish, some that should be removed to balance things out. Anglers as well as fly fisherman do well fishing early morning or just before dusk when bluegills are feeding on the surface using small surface lures, poppers and flies. Sunfish, once hooked put up an excellent fight and when it comes to eating, make one of the finest meals. Gary Howey, Hartington, Neb. a former tournament angler, fishing & hunting guide, an award winning writer, producer, and broadcaster and recently inducted into the “National Freshwater Fishing Hall of Fame” in 2017. 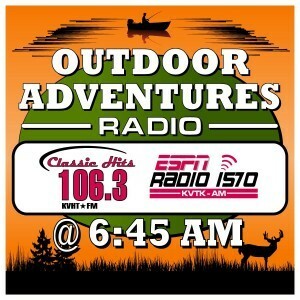 He is the Producer-Co-Host of the Outdoorsmen Adventures television series and Outdoor Adventures radio. If you are looking for more outdoor information, check out garyhoweysoutdoors.com, like Gary Howey’s Facebook or watch his shows on www.MyOutdoorTV.com.